This vintage index filing cabinet wine cabinet is a fantastic feature for any large kitchen, dining room, or home office. With 64 sturdy drawers, it really is an ideal storage facility for any home or office. This superb solid oak vintage index filing cabinet can easily be used as a wine rack, as each drawer will easily take a standard wine bottle. 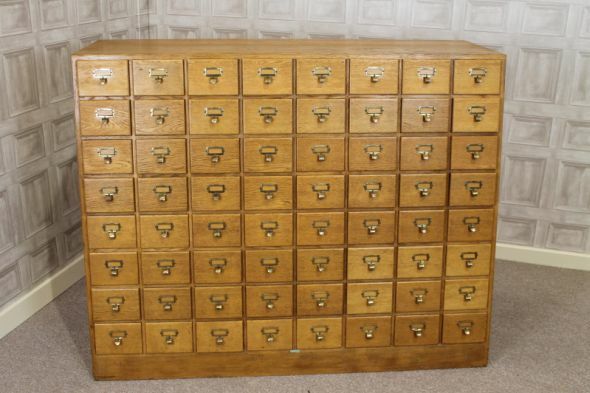 This 1930s vintage index filing cabinet is in excellent condition for its age, and still features all of its original brass pull handles and card handles. This index cabinet or wine cabinet could either be floor mounted, or it could sit on a large work surface or stand to suit your requirements. This index filing cabinet 1930s oak wine cabinet has a multitude of uses, and would complement any interior; period or contemporary.